Classic festive favourites rule the CNY menus this year at Xin Cuisine. Sticklers for traditions would be pleased with the wide selection of flavourful 'prosperity' dishes available in different guises: from set and a la carte menus to special dim sum creations that use ingredients with auspicious meanings. We fervently wished for excess abundance during the boisterous tossing of the colourful Salmon Yee Sang. Drenched with tangy plum sauce, the customary treat was as sublime as always; the hodge-podge of vegetable julienne, pickles and crispy bits well-balanced in flavours and textures. Besides Norwegian salmon, you can savour jellyfish, sliced abalone or shredded duck yee sang. Featured in the set menus and a la carte, the Yee Sang is priced at RM68++ to RM198++ (depending on portion size). The chefs pulled out all stops and served a handpicked variety of specialities to give us an overview of the delectable goodies that await diners throughout the CNY period. One of them is Mini Buddha Jumps Over The Wall - a clear double boiled seafood broth that was heartwarming in its delicate simplicity. A whole baby abalone, bamboo pith, sea cucumber and dried scallop lent their inherent sweetness to the soupy equation. One of the most anticipated central mains in the festive line-up is whole Roasted Suckling Piglet. Simply the bee's knees for die-hard carnivores, the crackling slivers should go down a real treat. For the uninitiated, Xin's BBQ Roast Selection: roast duck, char siew and roast pork in addition to the signature appetiser of sliced poached pork are equally notable. These meats are available a la carte throughout the year so we always have our fill whenever we lunch or dine there. The Teochew-style Steamed Dragon Garoupa is an indisputable staple that no Chinese family would turn their noses up at. You can rely on the Xin team to get the doneness right (touch wood). We love the tangy sauce from the pickled mustard (hum choi) and tomato; livened up with shredded scallion and complemented by soft beancurd pieces. Although the Baby Cabbage with Crab Meat doesn't make for a pretty picture, the taste is up to scratch. Again understatedly "ching" accent prevails with both the vege and crabmeat-mushroom sauce flaunting muted sweet notes. IMHO, Xin serves arguably one of the best Waxed Meat Rice in the CNY dining circuit. The rice came slightly smoky from the layer of scorched crust at the bottom of the claypot while the fluffy grains glean their mouthwatering aroma from the milieu of sliced waxed sausages, briny waxed duck and waxed meat adorning the top layer. Price: RM40++ to RM98++ per portion depending on serving size ordered. Bringing the curtains down are Nian Gao (RM9.80++ each) prepared in various tempting ways. Subtly sweet on the palate, we relished every bite of the sweet potato and baked peanut variants. Other creative permutations include macadamia nuts and pine seeds with osmanthus. Chilled Jackfruit Puree with Sago Pearls & Red Kidney Beans rounded off our preview -it's the dessert of choice that appears in this year's festive set menus which range between RM1,188++ and RM1,588++ per table of 10 persons. For reservations at Xin Cuisine, please call: 03 2144 8750. Address: Lobby Level, Concorde Hotel Kuala Lumpur, 2 Jalan Sultan Ismail, Kuala Lumpur. on the second day (Feb 20), 9.00 am. 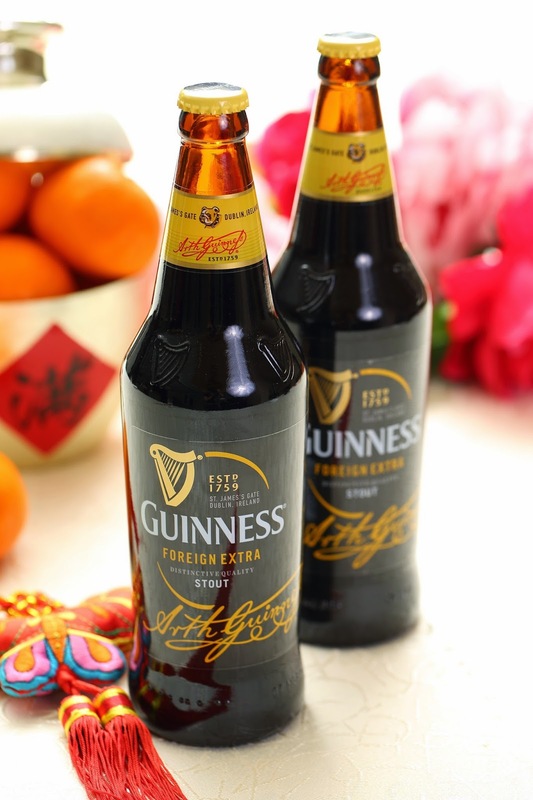 Iconic GUINNESS® stout teams up with the Grand Imperial Group of restaurants to create a special GUINNESS® Lunar New Year menu to welcome the Goat Year with bold prosperity. At a lavish sneak preview hosted by Bruce Dallas, Marketing Director of Guinness Anchor Berhad, we were treated to a sumptuous eight-course banquet paired with GUINNESS® stout served in different ways to complement and bring out the full flavours of each dish. Dinner was off to a rousing start with the customary serving of Yee Sang – a rainbow-hued platter of fresh shredded fruit and vegetable that included crispy fried white bait, lots of almond flakes, cashew nuts, shredded mango, jambu air and chicken floss generously doused in a tantalisingly tangy sauce. The general consensus was favourable especially among us ladies who raved over the salad’s subtly tart accent and crunchy, nutty dimension. Suffice to say, the yee sang went superbly well with the rich, bold stout too. Next up was a bowl of Bird's Nest Soup – a velveteen broth brimming generously speckled with aromatic black truffle flecks, chunks of fresh crab meat and delicate wispy egg white commas. A delightful luxe treat that even a non-soup fan like yours truly couldn’t resist. After warming up our tummies with more GUINNESS®, it was time to pig out on Crispy Suckling Pig – a glorious showpiece of crackling crisp skin rectangles savoured with scallion florets and sweet bean sauce. Yummeh! By now our GUINNESS® is chilled with some ice cubes, lightening the complex brew somewhat as we snapped up the smooth chunks of the sizeable Steamed Pomfret. The flavourful pool of classic Cantonese-style light soy sauce ramped up the fish's inherent sweetness, accentuated by some caramelised onion and pork strips. Despite some much ado over a crustacean, ample attention was devoted to the claypot of Freshwater Prawns. Slick, sweetish-savoury tomato-soy sauce hugged the delectable largish big-headed prawns, never mind if they turned out a tad overdone. Our glasses were never empty prior to the appearance of Braised Sliced Abalone with Dried Oyster & Beancurd Sheet (tau kan). The stout’s robustness certainly went glove in hand with the earthy, hearty dish that promises good things/prospects ahead for everyone. Although the festive favourite of Claypot Rice with Waxed Sausages & Meat lacked the expectant ‘smoky’ overtone, everything was still polished off with much gusto. Happily, the dessert duet of Steamed Nian Gao and Sweet Potato Pastries more than made up for that minor hiccup. The intermingling textures and mildly sweet taste got thumbs up all round, washed down with a bowl of Chilled Mango Puree with Sago & Pomelo. Between 5 January 2015 and 28 February 2015, consumers throughout Malaysia may win one of the 100 pure gold bars with any purchase of a big bottle of Guinness, Tiger, Heineken or Anchor. All they have to do is look out for the winning bottle cap liners and answer a few questions correctly to stand a chance to win one of 100 bars of pure gold worth up to RM1 million. Now that herald Bold Prosperity indeed for the lucky winners. Once upon a time back in 1951, Damodaran Nair began plying his Indian food from a push-cart at Pintu Padang in Raub, Pahang. The former cook for British settlers soon made good on his food business, expanding it to a wooden restaurant in Sempalit – Raub’s largest village. To please his largely Chinese clientele, the savvy Domadaran tweaked his curry recipes, toning down the heat to suit their palate. The rest, as they say, is culinary history. Today, Damodaran’s famed repertoire of dishes are capably replicated by his daughter-in-law at KariGuys, a modest Indian restaurant tucked away in a corner of the Bangsar suburb. Owned and run by brothers Dinesh and Ramesh Nair, they are now the proud custodians of their grandfather’s precious recipes. Walk in and you'd find Chinese-style marble and wood-topped tables, chairs and stools set against an exposed brick wall and further in, a chalkboard feature wall. I’m a big fan of Indian rojak and the Rojak (RM7.50) at KariGuys is surprisingly up to scratch. One can easily down double servings of it in one sitting thanks to the irresistible combination of shredded yambean, beancurd puffs, fritters and hardboiled egg doused in that scrumptiously smooth, rich and well-spiced Sempalit peanut sauce. That aptly paved the way for the restaurant’s signature dish of Kari Ayam Sempalit (RM6.50 per pc). The large chunks of chicken is lean and juicy while the mildly creamy but flavourful curry gravy sets the tastebuds tingling; drawing its robust nuances from dried chilli, cumin, coriander, cinnamon, garlic, ginger and curry leaves, enriched with coconut milk. Likewise, the Sempalit Fried Chicken (RM6.50 per pc) is ‘to-die-for’. Marinated in a special house blend of eight spices for 12 hours, we can’t get enough of the super-crisp skin (look Ma, no floury batter!) and moist, tender meat. Nasi lemak fans should try the sublime Nasi Lemak (RM9.50) here which comes with a choice of chicken curry or fried chicken. If you prefer white rice, the Sempalit Mutton Peratal (RM8.50) and Prawn Sambal (RM8.50) are great accompaniments to spice up your meal. The former uses a signature blend of 11 different spices to cook that piquant dish while roasted and pounded dried chilli lends the latter its toasty chilli accent. Those who have friends in tow will do well to sample the Fish Head Curry (RM65 – red snapper, RM75 salmon). Bentong’s famous taufu pok (beancurd puffs), ladies fingers, tomato and brinjal wedges lend extra substance to this mildly hot offering. Diners can complete their meal with vegetable dishes (RM6 per portion) available. Take your pick from spiced brinjal, stir-fried cabbage or French beans with carrots or ladies fingers. While the Sempalit Curry noodles (RM8) doesn’t float my boat, it’s a viable option for those who eschew rice. For dessert, try the Sugee Cake – a luscious, buttery slice of sublime heaven to wrap up your meal on a subtly sweet note. Set lunch and dinner from RM12.75 onwards per person comprising 1 main course and 2 vegetable dishes with rice are also served daily. The restaurant also offers catering services. Check out KARI GUYS at 24, Lorong Ara Kiri 2, Lucky Garden, Bangsar, Kuala Lumpur. Tel: 03-2201 9388; 017-812 6595 from 11.45am-8.30pm daily.